» Online Videos – How Old Media, New Technology Is Driving Search! Online Videos – How Old Media, New Technology Is Driving Search! Why do we need to make our video searchable? Yes, the same old videos that we have been using for ages! Having a video is no longer useful unless it is created with search engine optimization in mind. According to emarketer, Online Videos are considered the third most effective online advertising media by US advertising executives today. Why Make Your Video Searchable? It is free! No Cost Per Click/Action: Unlike PPC/ Paid Search, currently there is no cost per click charge for video views on Video Search Engines. This makes online searchable videos a phenomenal free source of advertising. Social Media Tagging, Customer Reviews – Many Video Search engines allow the ability to tag your video, post reviews on their sites or email it to friend. This functionality opens up new low cost advertising media for search marketers. Universal Search – Recently Google and other search engines launched a feature called universal search. Universal search shows mixed search results from several online advertising media such as Video, Mobile, Local, and several others. Now video search results are showing up in major search engines under regular results. This helps in optimizing (dominating) search engine results effectively by adding video search in to your marketing mix. The Online Video developed for Search Engines is vastly different from the standard videos that you can get from companies specializing in video creation. Videos created by these companies (including online videos) are standard video files but are not optimized for search engines. It’s the same parallel as a search engine friendly website vs. a website that is set up as a brochure. Search engine friendly website can be found for different key words from the search engines; however, to view a brochure kind of website, you have to know the website address to get to that site. The search engine optimized video and standard videos differ from each other in the same way. A search optimized video can be found by users typing things relevant to your market on main search engines and in video search engines; to find your standard videos, the consumer needs to know the website address for the site where that video is posted. This makes the effectiveness of the 2 videos vastly different. Here is the step by step process you can follow to create and promote searchable videos. Keyword Research – Similar to the website, keyword research should be done as the very first step towards developing search engine optimized video. You should know before creating an optimized video the most relevant keywords people are using to search for hotel, lodging, or attractions in your area. Content – You want to make sure that video is posted on its own page and is surrounded by most relevant search engine optimized content. When search engines are doing the crawl of video, it is helpful to have HTML content surrounding the video. Search engines can read the id3 tags you have used to encode your video, body content you have on the page, and site map of the page where video is posted, even though they cannot read your video files. It is best to write the content describing topics covered in the video. Video Production – Once you have rough sketch of video content and flow, put together a cohesive story around your hotel, destination, and things to do. Video production should be done after you have written the script for your video. Try to engage professional talent to do voice over for your script. Video Optimization – Once the video is created, it needs to be optimized for web display and fast streaming. Encoding the Video – Encoding a video is very important step. You can use window media cleaner to encode your video. Encoding simply means embedding meta data – keywords, descriptions, titles, etc in your video so they can be searched effectively. Surround Video with HTML and Media RSS – Search Engine optimized video should be placed on a webpage where video content is displayed as simple HTML. Video webpage should have the rich content, meta-data for search engines, and Media RSS for RSS readers, RSS search engines, and aggregators. Video Submission – Once your video is created, it is important to submit the video to top search engines such as youtube.com, myspace.com, Google video search, Yahoo video search, iFilm.com, photobucket.com, etc. Video Tracking – Once video is created, you can use tracking software to see how many reviews are posted on the sites, how many people watched the video etc. After your video is created, you should submit it to main search engines and distribution sites. Here is a list of top 10 sites you can use to start with. Market share is reported as a percentage of sessions from the Top 20 video sites. Make sure to hand submit your video to video search engines and distribution sites. Every video site has a set of requirements such as files formats, video size, frame rates, ID3 tags, etc. Most sites ask for this information while submitting the video. Make sure each video has good call to action in the end such as URL address of the website or phone number to call. Use professional talent to do voice over. Create a compelling story highlighting all the reasons to visit your destination and stay at your hotel. Make sure to use right web friendly format. You do not want to have large file which no one can download or view. Make sure to encode your video with Meta data and create RSS so your video can be found on search engines. Make sure you have video site map and separate page allocated for each video. The page where you are posting your video should have search engine optimized content, meta data, RSS etc for engines to crawl your page easily. Submit your video on top ten video sites and track video viewer ship. Video search is growing rapidly. It is considered third most effective online advertising media today to reach your target audience. More and more newspapers and conference sites are adapting to the multimedia challenge by adding video to their web sites. Video search results are blending in to the main universal search. Currently there is no cost per view for online video. It is time for businesses to get a head started and use it effectively. It is one of the most effective media today to reach your target audience. Interested to see an example? 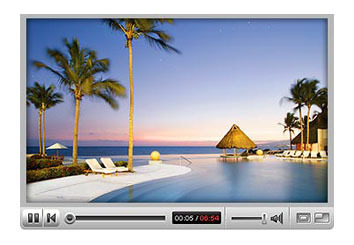 Click http://www.youtube.com/watch?v=HraOIiqdIn4 to check out the video for Grand Velas Resort and Spa. Article contributed by Benu Aggarwal, Milestone Internet Marketing. I discovered the benefit of bookmarking as a medium of promoting websites. I checked my friend’s way of using bookmarks for his site and now I check it on my side.